Today Nokia Unveiled it’s new Smartphone i.e. the Nokia C7. By seeing it’s features, one can easily guess that it’s mainly focused on Social Networking. It’s probably good that Technology & Social Media have become an integral part of our lives. With many phones coming out with Dedicated social networking keys; which gives one touch access to the respective sites & many others. But other features play a big part in a Smartphone too. Nokia has managed to cover that part up as well. A couple of months back we witnessed the Nokia Ovi Browser, which couldn’t compete well with it’s other competent. So that move by Nokia was a total flop show. Now they are back to what they’re best at. Yup, releasing new Smartphone’s focusing on a core feature, in this case Social Networking. 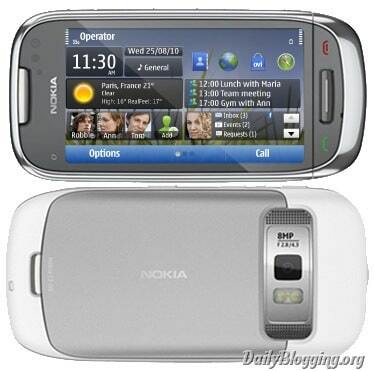 Also, Nokia C7 would be powered by the new Symbian 3.0 Technology. They claim that the phone is designed elegantly. I don’t agree with them fully; as it just looks like a normal phone. You can see the image I’ve added above. Let’s look at the features it has to offer. The only drawback with this phone is it’s price. But you won’t get such features under this price. The price of Nokia C7 is around $450. So it comes to around 20,000/- in Indian Rupee’s. So if you’re planning to buy a Smartphone, then I suggest you to go for this one. Subscribe to our RSS Feeds / Daily Updates to get a daily dose of tech related updates right into your feed aggregator/your Inbox. Do you have any plans of buying a new phone ? Would you go for C7 or N8 ?? This smartphone is surely perfect for bloggers to market their blog through social media at any time and every where. it is time that nokia started to doing stuff like this. off late nokia has been working/developing social connectivity on its devices and this is no exception !! ! Nokia is once again coming in to the race with N8 and the C series of its phone. C7 looks like a great phone. Fine phone but overprized by 5000 rs. for the features it promises. I agree with BD, Nokia is behind other competitors. They need to make some change of their strategies. I love nokia C cerise all phones. Excellent post and the c-series in nokia is always good for using the app. Thanks for sharing.